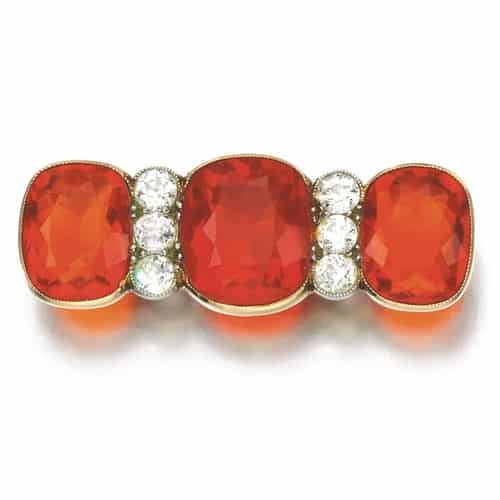 Fire opal refers to the variety of transparent red, orange or orangy-red opal usually lacking play-of-color. Fire opal is cut en cabochon as well as faceted. The source for this gem material is Mexico, hence the name. Edwardian Faceted Fire Opal Brooch. Similar Stones: Opal Can Be Confused with Glass and Some Plastic, and Redish-Brown Chalcedony for its Color. Gem Reference Guide, Los Angeles: Gemological Institute of America, 1988. Pp. 164-167. Newman, Harold. An Illustrated Dictionary of Jewelry, New York: Thames and Hudson, 1981. Pp. 126. Schumann, Walter. Gemstones of the World, New York: Sterling Publishing, Co., 1977. Pp. 152.